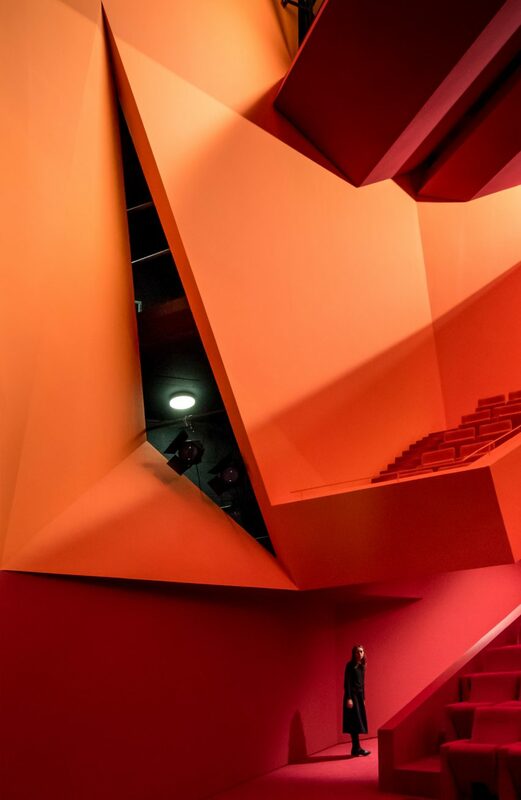 Stacked white, concrete volumes conceal the vibrant red, pink and orange interior of this theatre in the former mining town of Freyming-Merlebach by Dominique Coulon & Associés. 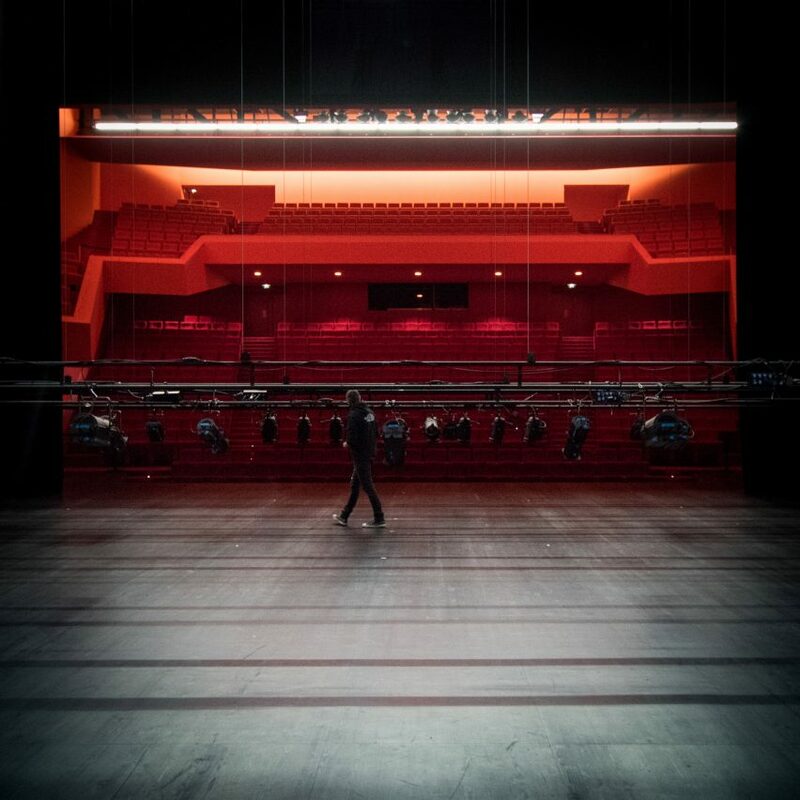 The French architects designed the Théodore Gouvy theatre as part of a drive to regenerate the town in north east France, which has seen high levels of unemployment since the area’s coal mines closed in the 1990s. 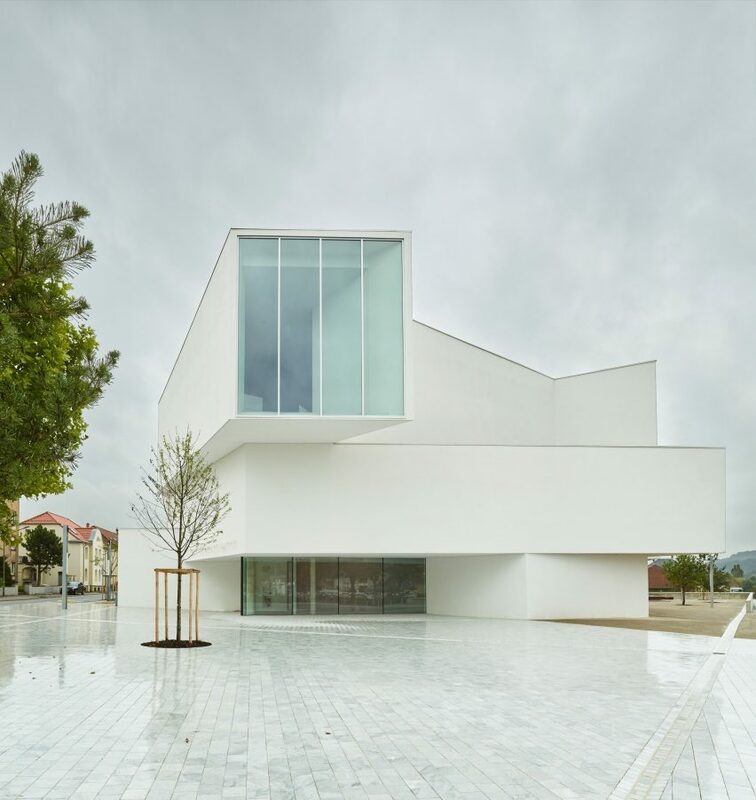 “Culture is seen as one possibility for resolving the accompanying social and economic difficulties in the town,” said the architects in a statement. 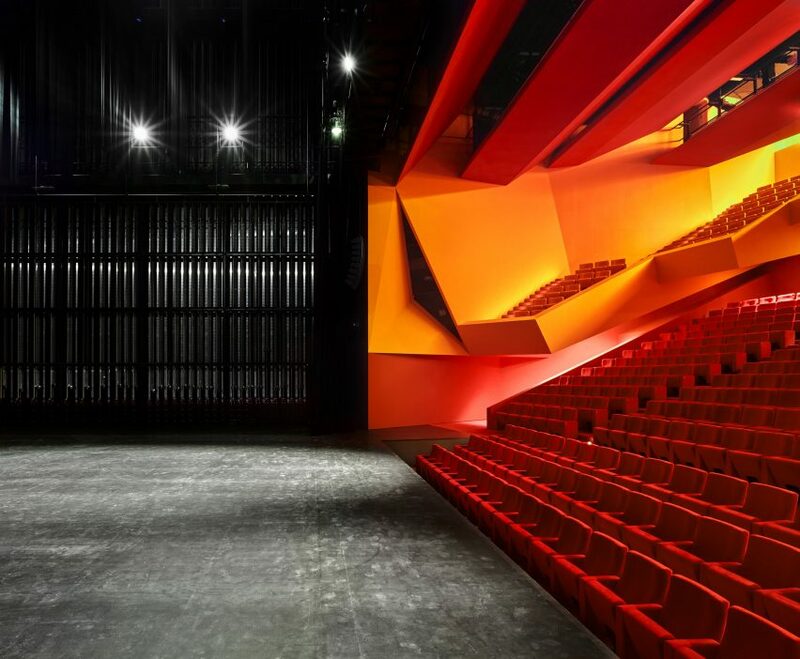 The €7.7 million (£6.8 million) theatre houses a 700-seat auditorium, which sets the stage for a multi-disciplinary program of classical, contemporary and musical theatre, as well as opera and dance. The performing arts centre sits on a base with a protruding glass entryway tucked below rectangular stacked volumes jutting out at irregular angles. A full length window on the uppermost volume faces the white bricks courtyard and the town beyond. “Its unusual shape and dimensions give it an streamlined silhouette, the lines of which ensure visual transition between the various parts of the programme while keeping on the same scale as the town,” explained Dominique Coulon & Associés. Inside, the offset cast concrete front desk sits on a polished grey concrete floor. 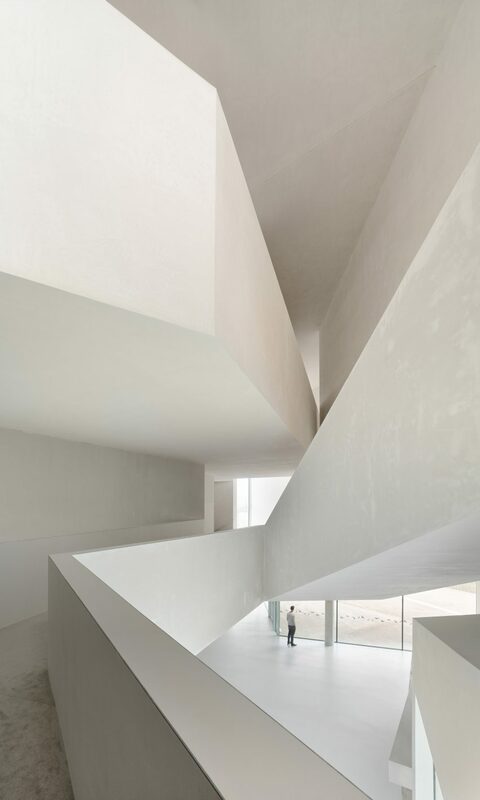 The walls and undersides of the above volumes are covered in a uniform beige plaster, with the angular spaces created by the intersecting levels left open. 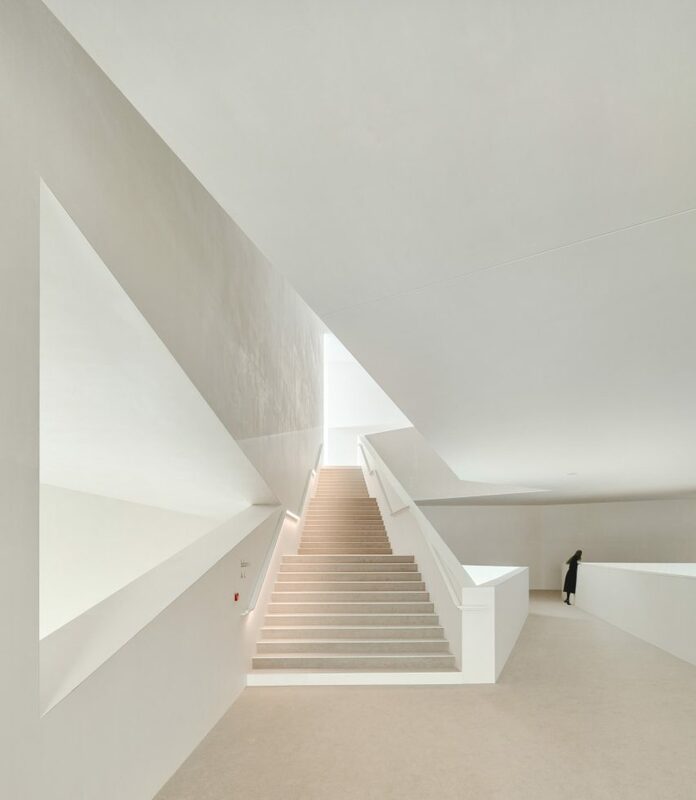 The route through the foyer to reach the auditorium is “deliberately spectacular and theatrical”, with carpeted staircases and ramps winding up two stories around a central void. “The uniformity of the untreated plaster and the softness of the carpeted floor contribute to the feeling of being in some kind of cocoon,” said the architects. 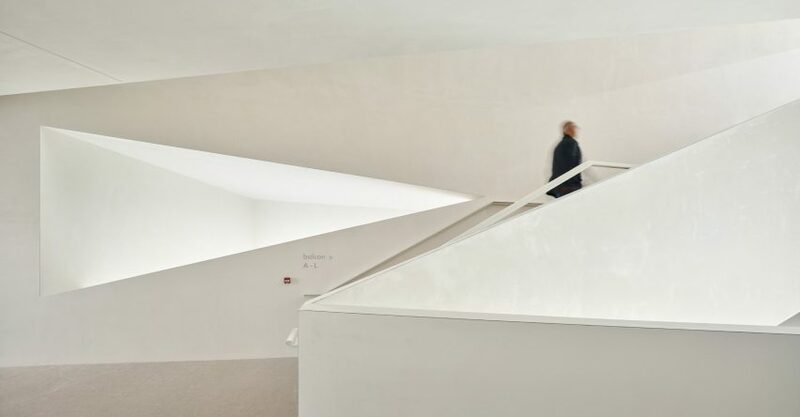 For the auditorium space itself, the architects employed a contrasting aesthetic to signal a “complete break” with the “nuanced surfaces” of the exterior and the foyers. Facing an all-black stage, the walls, balconies, levels and plush theatre seats are carpeted, painted and plastered in shocking reds, oranges and pinks. The bright palette is intended to “lend density to the space, affirming it as the main feature of the project, with colour sanctifying the idea of performance”. Although it can seat up to 700, the furthest a spectator has to sit from the front of the stage is 20 metres. Stepped seating and a wrap around balcony level provides uninterrupted sight lines for the performances. The stage is fully equipped to handle large-scale sets. The main stage measures 22 by 14 metres, with a proscenium of 14 by 9 metres. The stage house is 24 metres high and holds a catwalk and two lighting bridges. Behind the auditorium, backstage areas provide access routes and dressing rooms for performers and technicians. 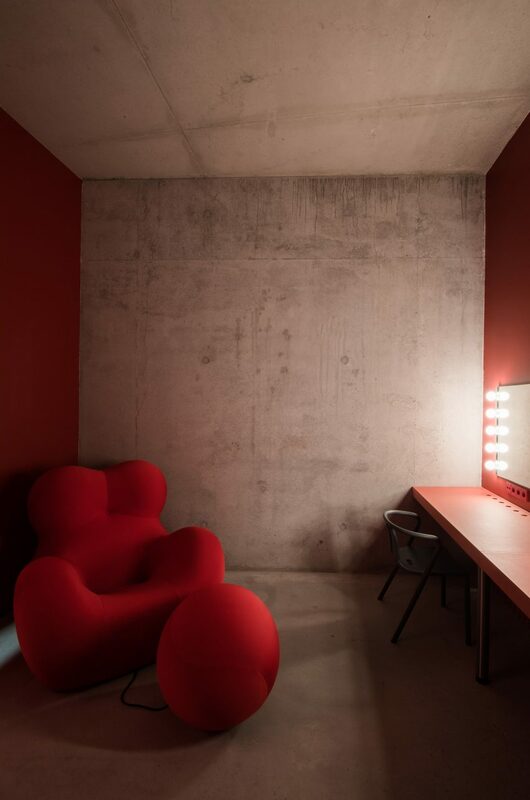 A third aesthetic language is established for this more private area, with exposed rough concrete walls and floors accented by deep red furnishings and mirrors lit by unshaded bulbs. 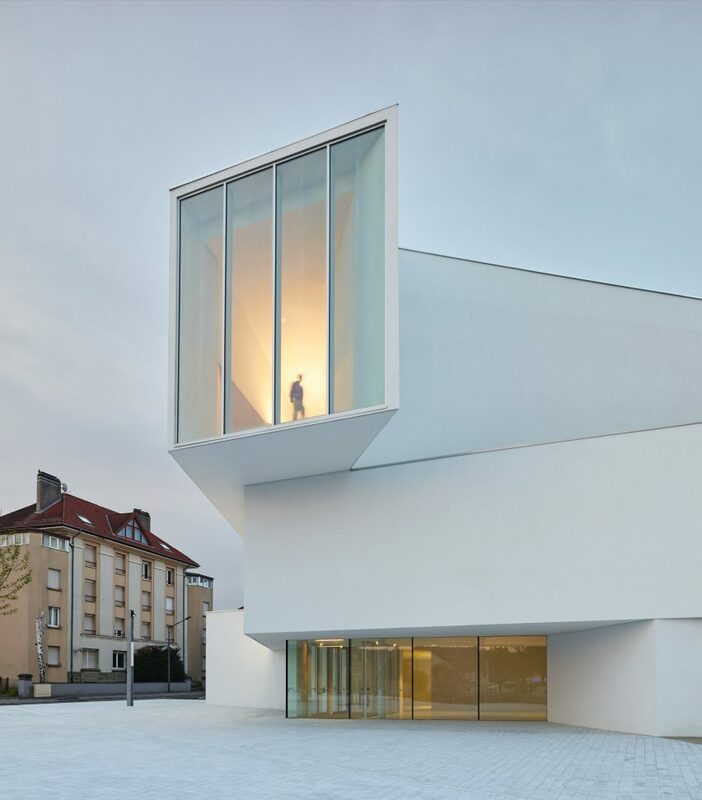 The Strasbourg-based architects have made a name for themselves with bold, modern buildings that employ dramatic combinations of colour and form. For a music school in the city of Belfort Dominique Coulon & Associés designed another stack of volumes, this time in grey concrete spattered with Jackson Pollock-esque streaks of blue paint. They used a similar palette of bright pink and orange to paint the niches of a school clad in bark batons in a Parisian suburb, and for the detailing of a cluster of schools located just outside the French capital. Photography by Eugeni Pons, David Romero-Uzeda, Thibaut Muller.